Crustacean identification guide Coral Reef Crustaceans is newly available at Apple’s iBooks Store. Mr. Andrey Ryanskiy is the author of this interactive crustacean identification guide. He is a Moscow-based financial consultant. He and his wife Irina are avid underwater photographers. The book represents countless dives over six years. The goal for his crustacean identification guide is to educate, entertain and inspire. Coral Reef Crustaceans contains more than 780 photographs. Of the 490 species covered in the book about 160 of them have never before appeared in other field guides. Leading marine specialists confirmed the scientific names of the critters contained in this crustacean identification guide. As its subtitle indicates, the region covered is from the Red Sea to Papua New Guinea. This guide is well organized and easy to use. Photos are high quality, full-screen shots. It is a multi-touch book and best read with iBooks. Divers who have a Mac or iPad or use iTunes can download this crustacean identification guide for USD4.99. What a great bargain for 257 pages! In December 2014 Andrey and Irina spent five days diving in Gorontalo. They returned for four more days in January 2015. 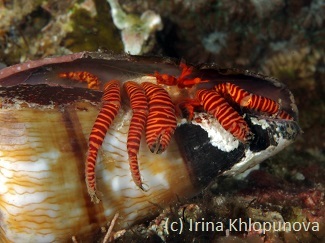 Marine scientists consulted for the crustacean identification guide recommended diving in Gorontalo to them. The reason was the unique marine species available here. Andrey would often ascend from a dive to share something new or rare he had just seen or photographed. For him the most fascinating areas to search are below 40 meters and above three meters. 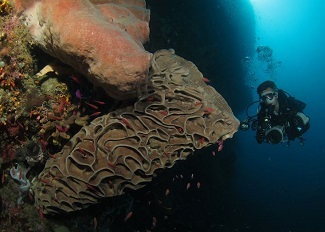 He recommends Gorontalo for its combination of great wall dives and “pure blood” muck diving. He also notes that Gorontalo is one of the few regional destinations with good diving weather over the New Year period. Irina wishes the dive guides of Miguel’s Diving were available in other locations. On one diving day, Andrey opened his book on his iPad and showed Miguel’s Diving staff his favorite crab, Trizopagurus strigatus. It is rarely seen. During the next dive, his guide found one for him. And Irina’s guide found another one for her! A killer whale cruised Gorontalo waters on New Year’s Day. Waters off most dive sites in Gorontalo plunge to hundreds of meters. These deep waters bring large cetaceans close to land. Miguel’s Diving staff have discovered the ocean paths that large sea creatures use. One is along Olele Village Marine Park. For the third time this dive season, Miguel’s Diving staff watched a single killer whale cruise just off the wall. Judging by the height of the dorsal fin, this killer whale was male. It was five meters long. He breathed on the way past the dive boat, sending spray into the air. Staff believe this is the same one previously seen. Killer whales are also called orcas. Their scientific name is Orcinus orca. They are mammals and the largest member of the dolphin family. Male killer whales are easy to identify. Their dorsal fin is very tall and straight. The body color is jet black with the familiar pure white patches. Their great girth make them look very big. 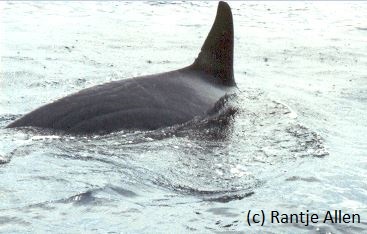 Females have smaller, curved fins but retain the white patches. Usually killer whales are found in pods. 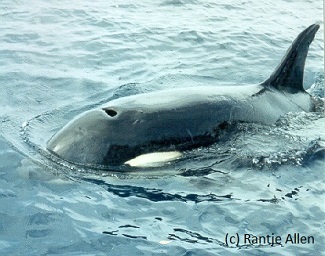 Killer whales are active marine predators. A killer whale will eat many things, including squid, fish and sea turtles. They also will eat birds, seals and dolphins. A pod of killer whales often coordinate their hunting. They will even kill and eat large whales. There are no reported killer whale attacks against divers in the wild. Scientists have discovered two genetically distinct forms of killer whale. One are called transients. They travel over wide distances and have distinctive behavior. They swim singly or in small pods up to seven whales. The others are called residents because they have smaller home areas. The pods are larger. Miguel’s Diving staff hope that the killer whale we are seeing will form a resident pod!